Joe's family. This picture was taken in 1938 in a garden in Joe's hometown of Zakroczym, Poland just before his Aunt Ruth Kadish left for the United States. 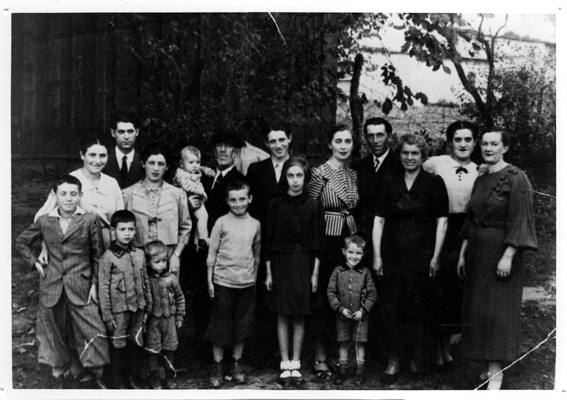 First row, left to right: Joe Engel; Joe's two nephews (names unknown, both were Rosa Berstein's sons); Pesach Engel (Joe's youngest brother); Fay Kadish (Joe's first cousin); Joe's nephew (name unknown, son of Raffi Engel); Esther Engel (Joe's mother, nee Zylberstein); Chava Engel (Joe's sister-in-law, Raffi's wife). Second row, left to right: Hinda Engel (Joe's sister); Abraham Berstein (Joe's brother-in-law); Rosa Berstein (Joe's sister); unknown (Raffi's baby boy); Moishe Engel (Joe's father); Ben Engel (Joe's brother); Aunt Ruth Kadish; Raffi Engel (Joe's brother); Irene Engel (Joe's sister). Survivors of the war: Joe Engel, Ben Engel, Irene Engel, Aunt Ruth Kadish, and Fay Kadish. Everyone else in this photograph perished during the war.